Audio-Technica earphones have a reputation for toughness and responsiveness. However, the Audio Technica ATH-SR9 offers an amazing high-resolution sound that may make you question your long-held beliefs about headphone frequency response. These ATH headphones are game changers. These over-the-ear hi-res earphones achieve superior sound by use of two 45 mm “True Motion” drivers with bobbin-wound OFC-7N voice coils and a diamond-like carbon coating on the diaphragm to give you spectacular high-resolution audio reproduction. That translates to truly stunning sound. The “Midpoint Mounting” technology also provides an equivalent space between the front and rear of the diaphragm for optimal performance. An acoustic resistor in each driver helps control the airflow around the diaphragm, resulting in a smoother and more natural sound reproduction. You put all that together, and it makes for a surprisingly wonderful headphone experience. But, that’s just some of the specs, making the call on your next purchase requires more information. Are they comfortable? How do they stack up? If you’re seeking an SR9 review that will help you decide whether to take the next step toward pure audio perfection, you’ve found it. The ATH-SR9 has a sleek finished, aluminum design. This not only looks beautiful, but it’s also functional. The stable design aluminum earpiece construction, secured by several flush-mounted screws, considerably reduces noise from resonance. The durable, yet soft earpads and headband foam make this unit as comfortable as it is durable. Over time, the headband foam will conform to the user’s head, creating a comfortable “custom fit.” Professionals once considered lightweight quality headphones an oxymoron at one time, but weighing in at a just slightly over half a pound, you will hardly even notice that you have these on. The Audio-Technica ATH-SR9 also comes complete with two detachable cables that are each 1.2 meters (3.9 inches) long. One is a standard headphone cable, and one comes equipped with an in-line control panel. 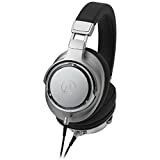 One advantage of this configuration over Audio-Technica wireless headphones is that it not only allows you to adjust the volume but also has a built-in microphone and allows you to answer incoming phone calls. Both these cables are equipped with Audio Designed Detachable Coaxial (A2DC) connectors in the headphones, providing not only durability but also an exceptionally stable audio connection. Audiophiles have widely assumed that hi-res audio was developed hand-in-hand with compact disc technology in the early 1980s. The truth is, digital recording developments of the ‘80s and ‘90s have run counter to hi-res remastering of those recordings due to the limitations of the original digital masters. High-resolution audio needs an analog master to produce the full range of frequencies and dynamic range. When creating digital masters, audio pros thought that they only needed to be as good as the CD technology of the time could reproduce, which was 44.1 kHz at 16 bits. To fit more data on a CD, audio engineers developed digital compression techniques that made remastering them to high-resolution sound quality even worse. CDs and MP3 files are rapidly becoming old school and supplanted by lightning-fast internet downloads and Free Lossless Audio Codec (FLAC) files. Streaming is now the standard method of music acquisition and that, coupled with inexpensive and convenient storage in the terabytes, has opened the door for hi-res to be the next step in the long, winding history of the pursuit of perfectly recorded sound. With 44.1 kHz at 16 bits giving way to 96 kHz at 24 bits and higher, the time has come for hi-res audio and, naturally, hi-res audio gear. Features, feel, folding, and durability are all well and good, but they don’t mean a thing if the sound isn’t right. While Audio Technica designed the ATH-SR9 as a portable headphone set, it sacrifices nothing in the sound department to achieve this. With a super wide frequency range of 5Hz to 45,000Hz, it will cause you to rethink the concept that 20Hz to 20kHz is the ideal spec you should look for in headphones. You may be one of those audiophiles who has always considered that frequencies above 20kHz and below 20Hz are useless because they fall outside the typical range of human hearing. While this is ostensibly true, it does not take into consideration the fact that superior hi-res sampling rates can create cleaner and more accurate sound recordings that require a broader total frequency response to for accurate reproduction. You may not hear those frequencies, but you will be aware of the improvement as the sound will be noticeably smoother, more vibrant and cleaner. When it comes to specific frequencies, the clarity of the high frequencies of the ATH-SR9 is nothing short of astonishing. This is true even when listening to non-hi-res recordings. My initial concern was that they would be overpowering, but they were clear and rich, not grating. The mid-ranges are full and present with far more clarity than headphones designed to focus mostly on bass. Speaking of bass — it’s deep and vibrant without being overpowering and interfering with the other frequencies. In this video, Inner Fidelity talks with an Audio-Technica rep about the ATH-SR9 at the Consumer Electronics Show (CES) 2017 industry tradeshow. Is the ATH-SR9 the Right Buy for You? In 1962, Japanese engineer Hideo Matsushita launched Audio-Technica in Tokyo, Japan. The company focused on manufacturing replacement phonographic cartridges: the AT-1 and the ‘Moving Magnet’ type AT-3. Since that time, they’ve become a worldwide leader in home and professional audio equipment. A diverse client list relies on their products, ranging from the occasional home audio enthusiasts to the U.S. Senate and House of Representatives. They’ve also graced events like the GRAMMY® Awards and the Rock & Roll Hall of Fame inductions. Most importantly, Audio-Technica support is available everywhere on earth that sound is reproduced and enjoyed. While finding a high-quality headphone is a difficult task, the Audio Technica ATH-SR9 stands above most of the field. It’s lightweight, comfortable, portable, stylish, and costs under $450. This results in a well-balanced sound with an ultra-wide frequency range. It should easily cover the highs and lows that any system can send to it. But, make no mistake, these are audiophile headphones. Not to say they are not superior for everyday use. However, Audio-Tecnica designed them to be responsive to far more frequencies than most systems can produce. No matter where you plug them in, you will hear things you never knew were there. Always a plus in any audio equipment.